Since 1984, Grundorf has been providing musicians and DJs with quality cases, racks, and accessories. Known for their durability and value, Grundorf offers a complete line-up that features many unique products. DJs can enhance their performance setup with a variety of Grundorf tables and facades. The guitar maintenance table and the guitar stand case are must-have items for any guitarist. Looking for an no-hassle way to transport gear for rehearsals and performances? 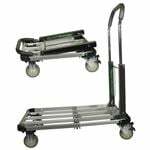 The Grundorf collapsible Road-Runner cart makes moving all types of equipment easy! For anyone who needs to rack mount gear, be sure to check out their heavy-duty ABS Series rack units. Grundorf GSLSW4863TB White Lycra Facade 48" x 63"
Grundorf AT6022 Adjustable Height Carpeted Table 60" x 22"
Grundorf GSPF4863TB Plastic Facade with Black Frame 48" x 63"
Grundorf MLF4863 Mighty Light Façade Black Carpet 48" x 63"
American Musical Supply is excited to be your stop for Grundorf cases, bags, racks, and accessories! We offer True 0% interest payment plans - applying is easy and there is no credit check for our 3-pay plan on purchases from $49-1,500. Use your own debit or credit card, enjoy fast and free shipping, and add Grundorf products to your creative setup. We make buying Grundorf products quick and easy - in-stock items that are ordered before 4PM EST will ship out the same day! Do you have questions about Grundorf gear and want to know which items would be best for you? Give us a call at 800-319-9043 - our experts are standing by.